Prepare for Microsoft Exam 70-740—and help demonstrate your real-world mastery of Windows Server 2016 installation, storage, and compute features and capabilities. Designed for experienced IT professionals ready to advance their status, Exam Ref focuses on the critical-thinking and decision-making acumen needed for success at the MCSA level. 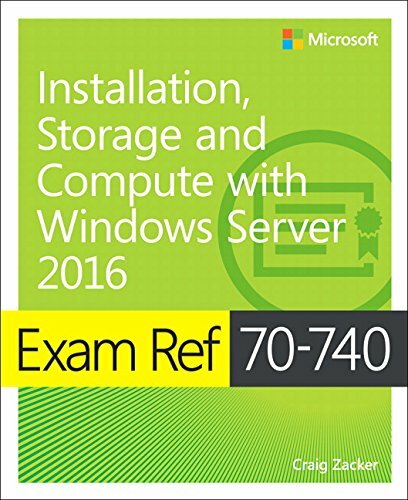 Exam 70-740 focuses on the skills and knowledge necessary to implement and configure storage and compute features and functionality in Windows Server 2016. Passing this exam earns you credit toward a Microsoft Certified Solutions Associate (MCSA) certification that demonstrates your mastery of core Windows Server 2016 skills for reducing IT costs and delivering more business value. Exam 70-741 (Networking with Windows Server 2016) and Exam 70-742 (Identity with Windows Server 2016) are also required for MCSA: Windows Server 2016 certification.